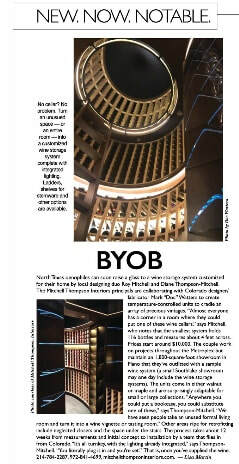 Mitchell Thompson Interiors' custom wine environments featured in the September Issue of 817Home!! Click on the article to see the full digital version of the magazine. ​Click Here to Read Press Release! Welcome to Mitchell Thompson Interiors! We guide you in creating the home you love to live in! Your family, your activities, your style, and your quirks are the heart of your home. Come experience impeccable service and attention to detail. Explore quality furnishings and all the possibilities at our furnished design studio. Feel the inspiration and creativity at work in elevating the design of your home. PLANO July 6, 2017 -- Mitchell Thompson Interiors has been selected for the 2017 Best of Plano Award in the Interior Designer category by the Plano Award Program. The Plano Award Program was established to recognize the best of local businesses in our community. Our organization works exclusively with local business owners, trade groups, professional associations and other business advertising and marketing groups. Our mission is to recognize the small business community's contributions to the U.S. economy. January 2015 – Mitchell Thompson Interiors of Plano, TX has been awarded “Best Of Houzz” for Customer Satisfaction by Houzz, the leading platform for home remodeling and design. This experienced and uniquely diverse design team was chosen by the more than 25 million monthly users that comprise the Houzz community from among more than 500,000 active home building, remodeling and design industry professionals. "We strive to elevate our clients' experience to a design process that reaches beyond what was imagined at the beginning and to exceed their expectations in delivering the finished project. We are so grateful to work with engaging clients and are inspired to be recognized for our efforts", said Diane and Roy Mitchell, Principals.